Our front loop love bubble wouldn’t be complete without adding the awe-inspiring blind landing a cheeky surface pass out. Tricks to blind looks phenomenal, feels sensational, and once you get the hang of landing blind; they will all start to be seen in your family of tricks. You will need to get this move sorted in your head before you go and play. In theory, it is one and a half front rotation, but if you attack it like this, it will be much harder for you to land. 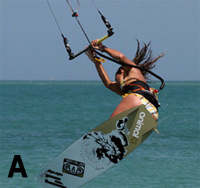 To get the control and therefore consistency out of this move, you must consider it for what it is – a front loop, but then in preference to landing on a flat board off the wind as normal. Here are the two parts to perform this trick perfectly without you getting in a midst of nowhere. No matter what move you’re attempting to blind, the key is having the move consistent so that you know how much rotation, how much speed and height you will have. If you practice your popped front enough, it will eventually feel natural to the point of the landing always being predictable. This way you’ll be able to think ahead, seemingly giving yourself time, and get yourself ready for a blind reception. Landing blind in most situations is all about “throwing it late”. That’s to say you go for the twist to blind just before you land. If you try and go blind up in the air, there is a little chance of holding that position on the way down. The answer is to wait until you think it is almost too late, and then go for it. As you can see this will be difficult without having the rotation that you expect. You may all want the style of some good surfers but you will have to build up to that. If you have been practicing your pop to raley to blind, you’ll notice that you are using your both hand t pull the bar in to rotate your blind. This gets the bar nearer to you, swings you towards the bar and in the front loop variant will stop you over-rotating. Admittedly doing it all one handed may look like “da bomb”, but it will be much harder, so get a grip. See pic A. In this phase you are in the “throwing it” phase. You need to pull the bar towards you with both arms and it should be twisted already quite far around, you need to let go of your back hand followed by your body and twist all the way. You are in the final phase now; this move is getting your body around to face the right way once you have landed. This will give you balance as it will stop you edging against the kite on your toes and it enables you to pass the bar. Like the surfer in pic B You should twist your left hand during the landing so that your thumb is pointing in the way you should go and this also will turn your shoulder more, then turn your head and look where you should go, which in turn puts your weight onto your heels and slackens the kite lines as you steer down towards the kite. It also puts the bar in place for you to reach up and grab it. FRONT TO BLIND – ALL IN ONE! 1-3. Carv hard upwind against the kite to get enough lift and time to rotate. Position the kite at about 11 o´clock. If you put it closer to 12 you´ll lose your forward momentum and drop in the water without power. Position the kite lower around 10 o´clock and you´ll land with speed, eventually with too much speed! 4-5. Rotate and extend and turn your head to start spot your landing. Also don’t pull to much on your back hand since this will get much harder to perform the handle pass if the kite is to high. 6. Your are now in the same position as you would be in a simple front roll. Focus on where you will land and force your hands, the control bar and the rest of your body around as if you´re preparing for for a downwind land. 7. Now it´s time to throw the bar. Pull the bar towards you and twist your hip, legs and board further. Pull the back leg up towards your bottom and extend your front leg. This means that even if you land across the wind, the board will pivot under your right foot and end up further off the wind. If both legs are straight you will just hit the water and stop. 8. As you land make sure that your weight is on your right leg to allow the board to pivot further off the wind (of course your right leg will be the left leg if you rotate in the other direction as the surfer in the picture below). 9. Twist your hand and point your thumb in the direction you´re going. 11. The turning will put the weight on your heels and take the tension of the lines, so you can bend over and get the bar nearer your back. Whilst steering, try not to have too much speed, as landing a fast blind is a challenge for you. 1. Carve hard to go up. 2. Get enough height and time for the rotation. 4. Let go of the body during the “throwing it” phase to rotate. 6. Look where to land. 7. Control your twist after you land. This entry was posted on March 12, 2015. It was filed under Advanced and was tagged with Front To Blind.